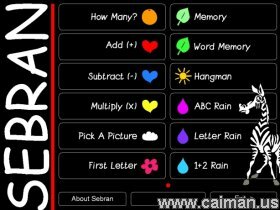 Caiman free games: Sebran's ABC by Marianne Wartoft. A Fun to Play learning Game. This is an Excellent all round learning game for young children that comes in many different languages. The graphics are basic, clear and easy for kids to relate to. All the games are fun and easy to do and will give many hours of learning in a fun way. A good amount of different games that will teach beginners the basics or even just to improve on what they would already know. A must for any family computer with young children.